The Coastal Multi-Species Conservation and Management Plan (CMP) was developed using a lengthy public process to understand and determine the fish management needs for the conservation and utilization of anadromous salmonids along much of the Oregon coast. 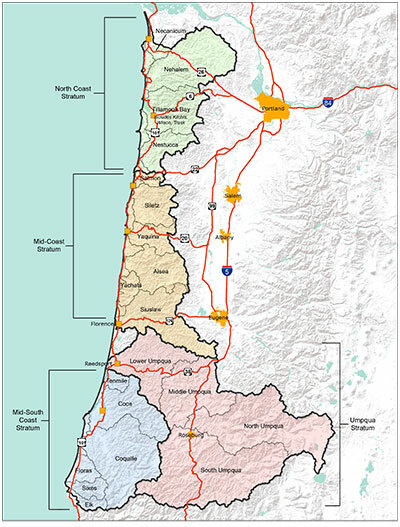 Public involvement in plan development included: a series of meetings with four Stakeholder Teams distributed along the coast; an independent, scientific opinion survey west of the Cascades conducted by Oregon State University; meetings with habitat experts working on the coast; review by an independent science team (i.e., the Independent Multidisciplinary Science Team [IMST]); a public comment period, including six public open house meetings on the coast and in the Willamette valley; meetings with various STEP and other interest groups; and review and approval by the Oregon Fish and Wildlife Commission. The CMP was approved by the Commission on June 6, 2014. The CMP addresses the following Species Management Units (SMU): Chinook salmon (spring and fall populations), chum salmon, steelhead (summer and winter populations), and cutthroat trout. The area covered by the plan ranges from the Necanicum River in the north to Elk River in the south. A conservation assessment and plan for coho salmon have already been developed and adopted by the Oregon Fish and Wildlife Commission (OFWC). Therefore, the CMP does not assess or address coho populations, although some coho information is included for a complete “picture” of all anadromous salmonids. The CMP indicates that, with the exception of chum salmon, all species are currently viable and “healthy”, although not necessarily at historical abundance levels. Chum salmon are identified as a species of critical concern. Out of 63 populations assessed in the CMP, there are only two non-viable populations: Elk River Chinook and South Umpqua River spring Chinook. The CMP identifies and prioritizes strategies and actions to address the conservation concern for chum and these two populations. In addition to these conservation measures, the CMP guides fish management actions relative to fishing opportunities, hatchery programs, predation on salmonids, and habitat needs in the planning area. The plan establishes a “portfolio” of different management approaches for fishing opportunities and hatchery programs across management areas and species. Thus, the CMP establishes a range of risks relative to conservation and utilization that is intended to ensure both strong wild populations and fishing opportunities into the future. The plan depends on and values both wild and hatchery fish to drive fishing opportunities and contribute significantly to local economies. It also envisions improvement in wild populations and fishing opportunities through the portfolio approach, effective management of predators (e.g., seals, sea lions, cormorants, and non-native fish), and, especially, habitat protection and restoration. To help inform CMP development, ODFW worked with the Oregon State University Survey Research Center to develop two questionnaires to gauge public opinion about fish management in the area covered by the CMP. The OSU Survey Research Center then carried out a public opinion survey by randomly selecting the addresses of individuals to receive one of the questionnaires, mailing out the questionnaires, following-up if needed, and collecting responses. The General Public Survey questionnaire was sent to 1,500 randomly selected residents of Western Oregon that did not buy a fishing license in 2012. The Angler Survey questionnaire was sent to 6,000 randomly selected anglers who live in Western Oregon and purchased a Combined Angling Tag (i.e., Salmon/Steelhead Tag) in 2012. In addition to the questionnaires, a Survey Map was provided to all of the randomly selected respondents. The map is referenced in both questionnaires and shows the area of the coast and major basins/populations covered by the Plan.